CUNNINGHAM Group Captain John, CBE, DSO**, DFC*, Silver Star (USA), Order of Patriotic War (USSR). He commanded 85 Squadron in a night-fighter role from January 1943. At the beginning of the war, he flew Blenheims; however they lacked the speed necessary to catch enemy bombers and were replaced by Beaufighters and later the high-performance Mosquito which had the guns and radar necessary for effective night interception. By the end of the war, he had destroyed 19 aircraft by night and one by day, having well earned his nickname 'Cats Eyes Cunningham'. 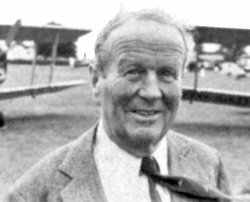 He returned to De Havilland Aircraft Co., becoming Chief Test Pilot in 1946 and went on to break many speed records and win many aviation awards.